The IUPAC Series on Analytical and Physical Chemistry ofEnvironmental Systems provides the scientific community with acritical evaluation of the state of the art on physicochemicalstructures and reactions in environmental systems, as well as onthe analytical techniques required to study and monitor thesesystems. The series is aimed at promoting rigorous analysis andunderstanding of physicochemical functioning of environmentalsystems. Soils are a major component of the ecosystem. A fundamentalawareness of soil structures and processes at the molecular andmicroscopic level is therefore essential to understanding andregulating the behaviour of environmental systems and thecirculation and impact of anthropogenic compounds. Structure andSurface Reactions of Soil Particles addresses the basics ofstructure and surface reactions of both soil particles and colloidsand describes their characterization and properties. New approachesusing fractal analysis of particle dimensions, aggregation andsurface reactions, computer modelling of the structure andreactivity of humics and applications of atomic force microscopyare given special treatment. Advanced instrumentation for analysisof soil particles which help to model the processes in the soil arealso reviewed. Structure and Surface Reactions of Soil Particles isthe definitive guide to the analysis of soils for chemists andbiologists working in environmental analysis and soil chemistsstudying the effect of landfills and working on soil restoration. Pan Ming Huang, PhD, FAAAS, FASA, FCSSS is Professor Emeritus of Soil Science at the University of Saskatchewan in Saskatoon, Canada. Dr. Huang has authored over 300 refereed articles and book chapters, written two books, edited seventeen others, and served on many editorial boards. He received the Distinguished Researcher Award from the University of Saskatchewan and the Soil Science Research Award from the Soil Science Society of America. Nicola Senesi is Professor of Soil Chemistry and Head of the Department of Agroforestal and Environmental Biology and Chemistry of the University of Bari, Italy, where he has been actively involved in research and teaching since 1969. He has taught courses in Soil Chemistry, Soil Science, Agricultural Chemistry, Wood Chemistry and technology, Organic Chemistry, Wood Chemistry and Technology, Organic Chemistry, and General and Inorganic Chemistry. He has been a visiting professor and/or scientist for various periods at universities in Canada, USA, Somalia, Indonesia, Switzerland, Argentina, Brasil, Venezuela and Colombia. Dr. Senesi is a Fellow of the American Society of Agronomy - ASA - since 1995 and the Soil Science Society of America - SSSA - since 1996, and received the Gold Medal of the Polish Soil Science Society in 1994. He was conferred with a Doctorate Honoris Causa by the Institute National Polytechnique de Toulouse - INPT -, France, in 2000. Dr. Senesi is currently President of Division VI: Chemistry and the Environment and Chair of the Subcommittee on Biophysics-Chemical Processes in Environmental Systems of IUPAC, President of MESAEP, and Vice-President of the Italian Soil Science Society - SISS -, and was President of the International Humic Substances Society - IHSS - and Chairman of Division II-Soil Properties and Processes of the International Union of Soil Science - IUSS -. He is currently an Associate Editor of Geoderma, Soil Science, Pedosphere, Pure and Applied Chemistry and CLEAN-Soil, Air, Water. Dr. Senesi's research is focused on fundamental and applied aspects of the chemistry and biochemistry of organic matter from soils and other systems and materials, and its interactions with soil-applied organic chemicals and trace metals, by the use of advanced physico-chemical techniques and biochemical tools. MINERALS-ORGANICS-MICROORGANISMS INTERACTIONS AND CHARACTERIZATIONOF SOIL PARTICLES. From Particles to Architecture: Fractals, Aggregation and Scalingin Soil Science (J. Crawford & B. Sleeman). Fractal Principles and Methods Applied to the Chemistry of Sorptiononto Environmental Particles (I. Okuda & N. Senesi). ADVANCED INSTRUMENTATION IN ANALYSIS OF SOIL PARTICLES. Electron Microscopy of Soil Components (Y. Chen). Applications of NMR Spectroscopy to the Study of the Chemistry ofEnvironmental Interfaces (W. Earl & C. Johnston). Electron Spin Resonance Spectroscopy of Organic and Mineral SoilParticles (M. Cheshire & N. Senesi). 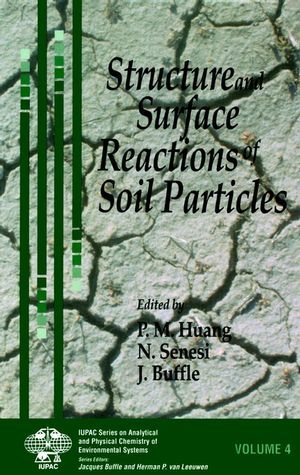 REACTIONS AND PROCESSES AT THE SOIL PARTICLE-SOLUTIONINTERFACE. Ion Adsorption at the Soil Particle-Solution Interface: Modelingand Mechanisms (S. Goldberg). Kinetics of Sorption/Release Reactions on Natural Particles (D.Sparks). Kinetics of Enzyme Reactions in Soil Environments (P. Nannipieri& L. Gianfreda).